Why Choose the Medical Laboratory Technician Program? Medical laboratory technicians perform routine analyses on blood and body fluids. Our Medical Laboratory Technician program combines class and laboratory training with clinical experience. Students cover a lot of information during their two quarters of academia on campus in a simulated clinical laboratory, as study focuses on the theory of laboratory testing of body fluids. Normal human anatomy and physiology and the changes that occur in diseased states are also studied. The clinical phase of the program covers the majority of the final two quarters, as students are assigned to laboratories in the Puget Sound area and rotate through all the departments of the clinical laboratory to gain experience. Upon successful completion, graduates are eligible to take the ASCP Medical Laboratory Technician certification examination, qualifying them for employment. With a completion time of approximately four quarters, our Medical Lab Technician degree is a fast way to get started on a great career in the health care field. There is a shortage of both medical laboratory scientists and medical laboratory technicians. Employers are looking for professionals with hands-on experience and a high knowledge level, along with excellent soft skills (pleasant to be around, interested in learning new concepts, quick to learn, but pay attention to detail, show up to work on time, and do their job efficiently and correctly). Graduation rates – NAACLS requires that 70% of students who begin the final half of the program successfully graduate. Graduate Placement rates – NAACLS requires that 70% of graduates either find employment in the field or closely related field (for those who seek employment) or continue their education with one year. Perform routine laboratory testing by following standard operating procedures in the laboratory. Demonstrating professional conduct and interpersonal communication skills with patients, laboratory personnel, other health care professionals, and with the public. Recognize and evaluate normal and/or abnormal patient test results, and understand which confirmatory testing is needed. Demonstrate an understanding of safety hazards and precautions and identify symbols. Relating laboratory findings to common disease. Recognize pre-analytical, post-analytical, and analytical variables and corrective measures. Medical Laboratory Technician Program Information Sessions are hosted in Building 21, Room 222, at 3 p.m. on the second and fourth Wednesdays of the month. For more information and a complete schedule of session dates, click here. Real-world experience can be one of the hardest things to acquire for a college student, but it’s also one of the most important factors for being hired after graduation. 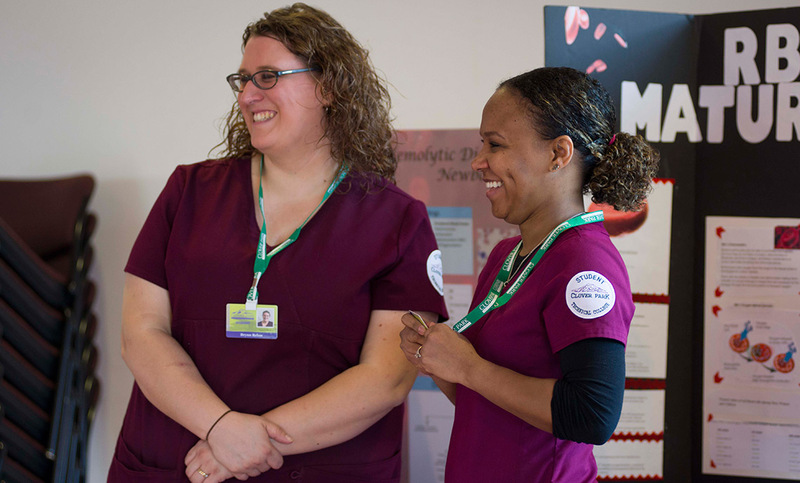 Clover Park Technical College’s Medical Laboratory Technician program sets its students up for success by holding an annual meet-and-greet for local clinical professionals to meet with CPTC students about potential internships in their labs. 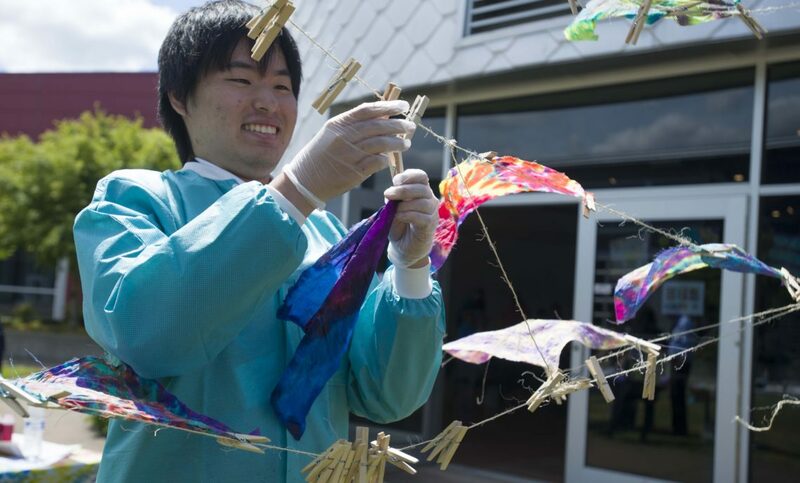 Japanese students, standing in front of a tie-dyed backdrop, donned colorful vests and hippie-style glasses to end their study tour with some American culture and good ol' “selfies,” May 20 at Clover Park Technical College. 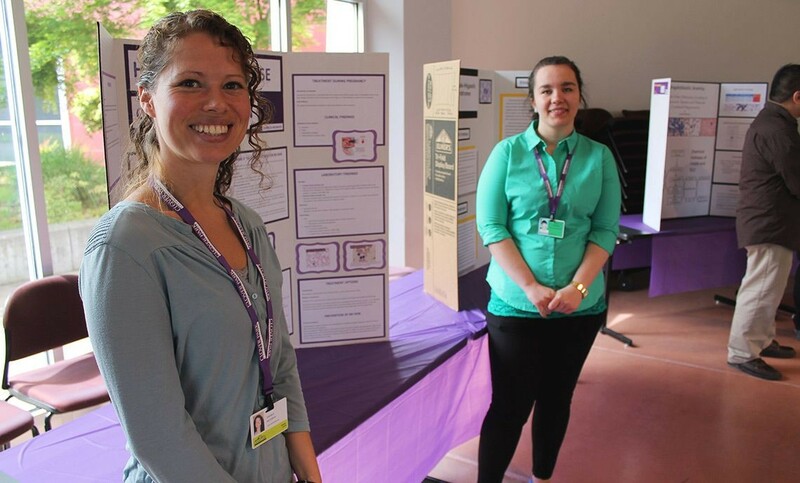 Dana Guinn’s Medical Laboratory Technician students are just a few weeks into their first quarter at Clover Park Technical College, but they had an early opportunity to connect with potential clinical site representatives at the program’s annual meet and greet event on May 6 in the Rotunda.